The top options on the Dashboard enable you to create a list, a campaign or view a quick start video. Email Balance refers to the number of individual emails you are able to send within a campaign. In the example below, there are 50 emails remaining. This means that the next email marketing campaign for this account may be sent to up to 50 different email addresses. 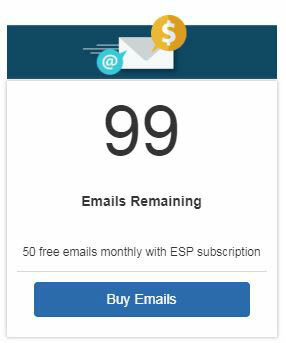 If you want to a campaign to more emails that the number shown, use the Buy Emails Here button to purchase more. Note: Emails refers to individual email addresses, not people. This means that if a customer has two email addresses, it will be calculated as two emails. Also from the Dashboard, campaign statistics will be displayed. Use the dropdown to select the timeframe (up to 180 days) for which you would like to view statistics. In the Your Campaigns section, a snapshot of each campaign will be displayed with statistics. Use the Export Report button to get a Summary Report or a Detail Report. A Summary Report contains overview information, including the sent information from the snapshot, but also the campaign name, status, scheduled date, and subject line. A Detail Report contains more information about the campaign.